1. 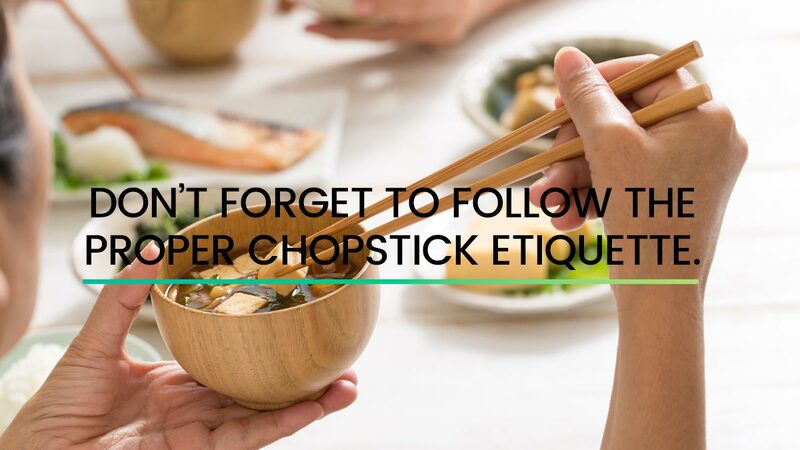 Don’t forget to follow the proper chopstick etiquette. Have you ever wondered why restaurants come with chopstick holders? It’s because sticking your chopsticks in your bowl of rice and leaving them standing up is a huge no-no. The act resembles a funeral ritual. Btw, rubbing your chopsticks together is also considered rude. 2. Don’t wear your shoes inside someone’s home. This one’s a pretty common rule in a lot of Asian countries. Understandably, shoes you use outside of your home are considered unclean; that’s why they have “indoor” slippers. But in Japan, this rule is also applied in some hotels, temples, shrines, and even schools. In some places, they even have another set of slippers for when you need to use the toilet, so make sure not to use your indoor slippers when nature calls. 3. Don’t disregard the queuing system. The Japanese have one of the most respectful and orderly cultures in the world. They take their lines very seriously. Hindi sila sumisingit sa pila! People patiently line up everywhere—at bus stops, train stations, and even by elevators. Be mindful of the queuing system to avoid accidentally cutting in front of someone. 4. Don’t blow your nose in public. That’s right. Blowing your nose anywhere but in a bathroom or a private space is a frowned upon in Japan. When someone is sick, it’s common to use a face mask to avoid spreading germs! In the U.S., tipping is mandatory. In the Philippines, it’s becoming common practice, but in Japan, it might be mistaken as an insult! Can you believe it? Most of their restaurants already include a service charge, but even taxi drivers insist on giving you back your exact change. When Japanese people need to indicate something, they gently wave towards a general direction because pointing—especially with one finger—is considered rude. And if they have to point at themselves, they touch their noses instead.